Abstract: With the trend towards less-polluting and sustainable transport solutions, the European Commission aims to strengthen the competitive position of inland waterway transport, and to facilitate its integration into synchromodal logistic chains. To stimulate inland waterway transport, it is essential to ensure smooth containers transshipments from seaports to hinterland and vice versa. Currently, inland vessels usually spend unnecessary long times in the port area due to insufficient terminal and quay planning with respect to the sailing schedules of the vessels. Coordination among multiple vessel operators and multiple terminal operators is required in order to improve the efficiency and reliability of inland waterway transport within the port. For this, four recently proposed classes of coordination strategies from our earlier work are reviewed. Two levels of cooperativeness, including partiallycooperative and fully-cooperative, as well as two types of interaction, including single-level and multi-levels are considered. The proposed coordination strategies are compared and evaluated from a methodological perspective and from an information needs perspective. 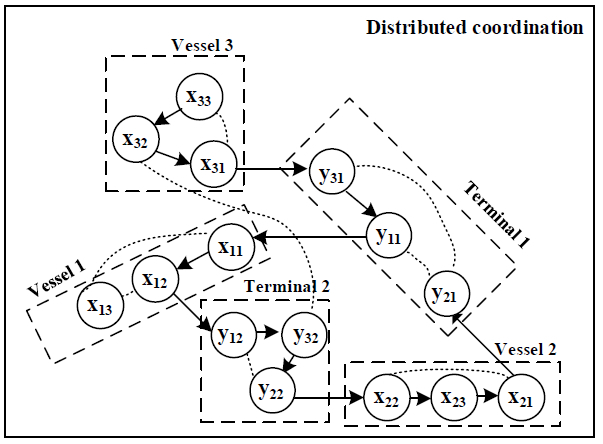 Our results provide insights for vessel and terminal operators in the ways in which they can cooperate with each other: firstly, vessel operators can decide to what extent they would like to coordinate their actions based on the information requirements of each coordination strategy; secondly, terminal operators can estimate information that should be made available during different coordination phases. Moreover, our results also provide insights for policy makers or practitioners to determine the most suitable coordination strategy under different circumstances.